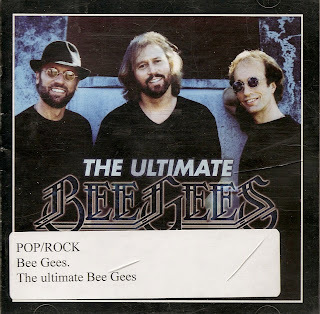 Rooftop Reviews: "The Ultimate Bee Gees"
I was never much of a Bee Gees fan, beyond their early hits such as "I've Gotta Get A Message to You", "New York Mining Disaster 1941" and the other early pop hits recorded between 1967 and 1972. Of course they scored a super crossover with "To Love Somebody", a great song by the Bee Gees, but a real blues experience in the hands of Janis Joplin, who had the ability to take any song and make it her own. Witness her recording of Kris Kristofferon's "Me and Bobby McGee." People still think she wrote that one. The Bee Gees became the soundtrack of the 1970's cocaine, Florida based sound of Disco music and Huck-a Poo shirts. This 2 CD compilation is a great testament to the contribution that the Bee Gees made to music. That they survived for 4 decades in an industry that thrives on change says some very strong things about the group, and ourselves. Did this group change over time, or with time? Did they steer, or were they steered by, the times they were in? There was a time when I wouldn't have been caught dead listening to something like "Jive Talkin' ", yet yesterday I found myself in the car, windows down, breeze blowing, singing along to it! And as the album played on, I began to realize just how much of the background music to my life has been by the Bee Gees. I danced to them in every major city of the world when I was traveling during the 70's and 80's. I listened to them as background music in movies and even in elevators and at malls. And they have been a staple at every Bar Mitzvah or Wedding that I have attended for the past 30 years. Checking out the playlist of 40 songs there is not one that doesn't evoke some sort of memory or event from their 3 decades at the top of the charts. The pictures of the group over the years also show a remarkable transformation of the brothers from Pop Stars to Disco Kings. Every once in awhile I surprise myself by reading, or listening to, something that I didn't think I really cared for. This was one of those times. As to the relevancy the Bee Gees still exert on our current music scene, both in sound and style - just check out the hat that last night's "America's Got Talent" winner was wearing and then look back at the cover of this album. Oh, and in between there has been another guy with a hat just like it. His name was Michael Jackson. The Vance Hotel - Statesville, N.C.